Your red carpet awaits you in glamorous Cannes. Visit high-end stores on La Croisette Boulevard or get horizontal on one of the exclusive private beaches, then be sure to sample the glittering nightlife. Cannes has an excellent location near to Antibes, Monaco, St Tropez and Nice, making it the perfect springboard for your yachting adventure in the French Riviera. We are here to help you create an itinerary that fulfils all your desires. Contact us here, or give us a call, and we’ll take care of all your yachting vacation needs. ‘A sailing vacation in Cannes’ could be the title of a movie – and when you’re aboard a luxury yacht moored off the coast of this throbbing, celebrity-packed city, it’s easy to imagine you’re in the starring role. 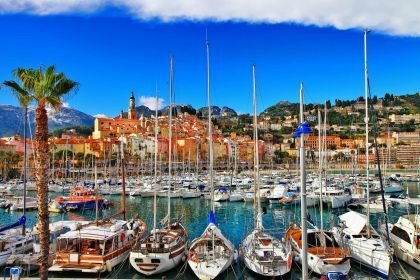 Situated close to Antibes, Monaco, St Tropez and Nice, Cannes is a perfect springboard for a sailing vacation in the French Riviera. Its magnificent views, beautiful beaches, waterfront restaurants and glamorous populace are a wonderful introduction to Riviera life. 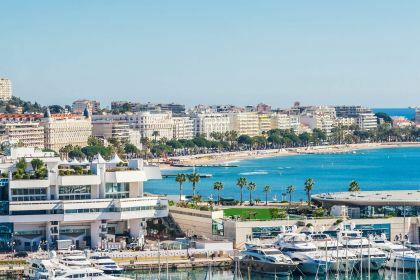 Moored in the harbour next to Boulevard de la Croisette – the town’s palm-lined promenade – you have a front-row seat for all the Cannes Film Festival action. Held in May, the festival attracts the world’s hottest celebrities, and the city’s streets, restaurants and hotels become packed with the crème de la crème of the film world. Luckily for you, you can sit back, relax and watch the spectacle from the comfort of your yacht while experiencing five-star service from your crew. Even outside film festival season, Cannes is a flirty starlet that will seduce you with her charms. With 12 hours of sunshine every day in summer, magical fireworks displays, grand 16th-century villas and picturesque olive and orange groves, there’s more drama here than a Hollywood blockbuster. If you need a break from the crowds, a half-hour sail will take you to the four Lerins islands, of which St Marguerite Island is the biggest. Here you can swim, snorkel and dive to your heart’s content. When you’re ready to return to the action, book a table at the seafront Michelin-starred Palme d’Or in the Martinez (also known as Palaces), one of Cannes’ most expensive hotels. With its cinema-themed décor, bay views, impeccable service and exquisite food, this is a dining experience you will never forget. On the other side of Boulevard de la Croisette, you’ll find Le Park 45, a delightful Michelin-starred eatery with contemporary decor and delicious Mediterranean-style food. Italian trattoria Da Laura (also Michelin-rated) is located further into the city and its vintage-style interior – complete with maturing hams, creeping vines and antique tiles – is popular with locals and visitors alike. Other restaurants worth a visit are Le Mesclun, which serves seasonal Mediterranean cuisine; Le 360º, whose name is derived from its panoramic views of the bay; Brocherie II and Villa Archange. If you’re planning to celebrate a meaningful event during your yachting vacation, Cannes has it all. Event management companies will take care of everything, from the catering to the venue. Fancy a rooftop terrace, a private beach, a luxurious chateaux or even a castle? Event planners will go out of their way to find the perfect venue and make sure your event is gold statuette-worthy. It would be a mistake to visit Cannes and not trawl the shops in Rue d’Antibes. Together with La Croisette, which is home to Dolce & Gabbana, Dior, Valentino, Lacroix, Gucci, Chanel, Louis Vuitton, Ralph Lauren and Chopard, Rue d’Antibes is the city’s main shopping street. Set aside an entire day for Gray d’Albion, a huge galerie offering clothing, perfume and accessories. Also check out Galeries Lafayette on Rue du Marechal Foch, three blocks from La Croisette. For a taste of real-life action-hero adventure, the Gorges Du Verdon – dubbed the Grand Canyon of Europe – offers myriad activities, including rafting, kayaking, paragliding, cliff-jumping and glider flying? Whether you’re eight or 80, there is an outdoor thrill here for everyone. 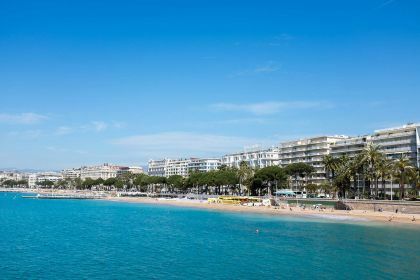 Cannes is wonderful any time of year – in May for the film festival, in September for the Royal Regatta, in February for the annual Fireworks Festival and every month in between.